Bride's..... this is the ONE DAY that you get to carry around a GORGEOUS bouquet of fresh flowers as an accessory. but I am sure I would get some awkward looks. Anyway... back to my tip. Even if you are a DIY bride and are creating absolutely every element of your wedding day..... hire a professional to make your bouquet. Truly it will be such a special moment for you to see this amazing arrangement. Bridal bouquet's are tricky! Make sure yours is what you have always dreamed of! A sneak of my past bride -Kelly's- bridal bouquet! can this bouquet be any more BEAUTIFUL!! 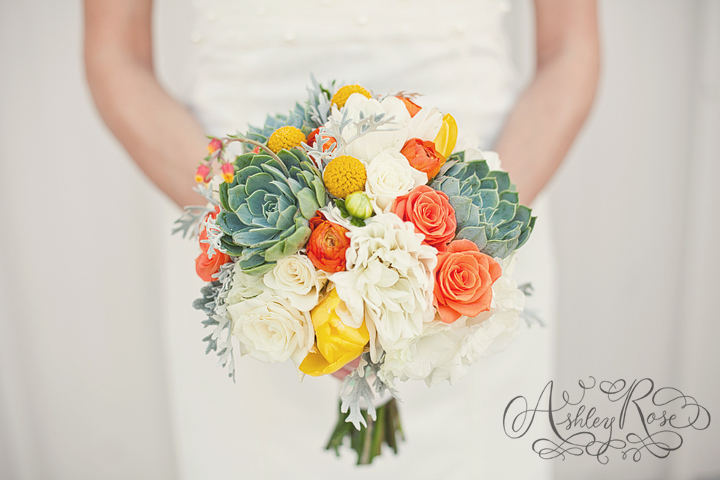 love the colors, flowers...and the succulents!! Oo I agree. A professional boquet arrangement brings the "details" to a whole new level. i love the warm colors in this boquet!